Hi I’m Heather! My family moved to Idaho from California when I was three. I spent my childhood growing up in Boise, Idaho, known for an abundance of potatoes and a growing population of outdoor lovers and microbrewery enthusiasts. Throughout my childhood I enjoyed shopping and plane rides for soccer tournaments. This allowed me to explore various states. After multiple visits, I fell in love with the beautiful green forests and the temperamental coast of the Pacific Northwest. When it was time for me to choose a college, Oregon was an easy choice. I found myself interested in smaller schools offering four seasons and never-ending outdoors opportunities. Southern Oregon University was the perfect place for me. I am currently in my junior year at SOU working towards a major in Business Administration focusing on marketing and a certificate in interactive marketing and e-commerce. This fall I was fortunate enough to spend three months studying in Winchester, England. During my semester abroad I studied fashion and media marketing. These courses validated what I wanted to do in my future. Many of my weekends were spent traveling to places I had been dreaming of for years. Paris, Prague, Dresden, and Edinburgh were some of the places I ventured around with wonderful new friends. I also spent multiple weekends in London visiting my brother and indulging in delightful food inspired from surrounding countries. 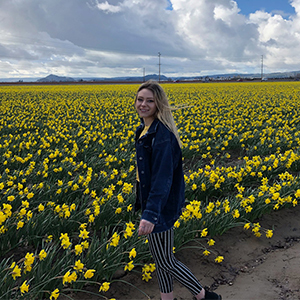 I look forward to finishing up my degree at SOU to hopefully continue my education in a fashion merchandising or graduate program in California, New York, or Europe. Check out some of my other work here! Also make sure to look through some of my fellow classmates pages here!